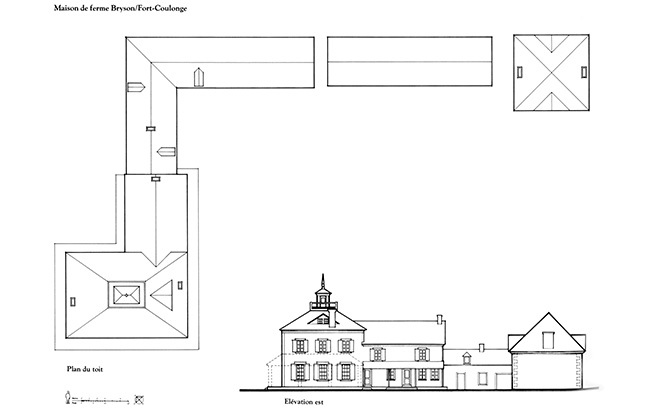 Plan and elevation of the Bryson House as drawn by Philip Gabriel. Elevation of the Bryson House as drawn by Philip Gabriel. 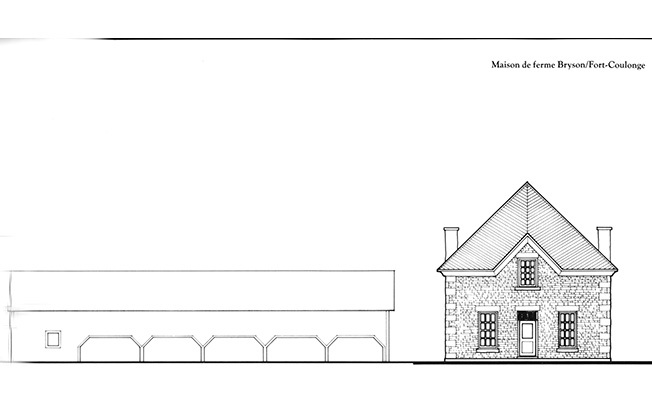 Elevation of the Dagenais House. It used to be the head office of the Bryson Lumber Company. Drawing by Philip Gabriel. 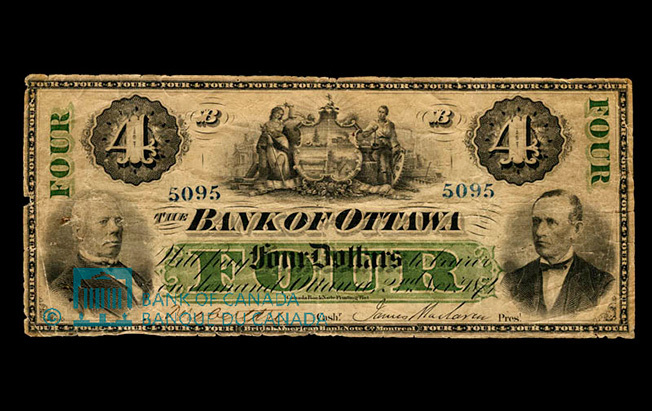 First $4 bank note issued by the Bank of Ottawa, in 1874. On the left can be seen the photograph of George Bryson and to the right, that of James MacLaren. Group of raftsmen pulling like mad at the oars to guide their square timber raft. George Bryson Sr was particularly involved in this sector of the timber trade. The large stone mansions of George Bryson Jr and of his brother John Bryson. Fort-Coulonge’s St. Andrew’s Presbyterian Church, built in 1890. This jewel of religious architecture is due to the financial generosity of the Brysons, a staunch Presbyterian family. 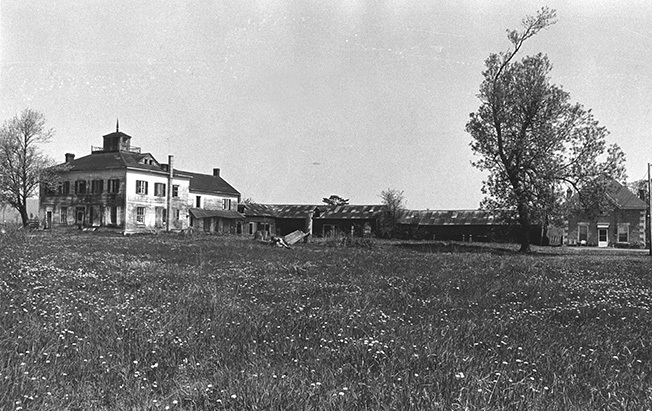 This photograph shows the state of neglect in which the Bryson House group of heritage buildings were in around 1975. The role played by Philip Gabriel and his friends from the Pontiac Heritage Group saved this architectural ensemble for posterity. State of disrepair the Marchand covered bridge linking Mansfield to Fort-Coulonge was in around 1960. The local population was mobilized and the bridge was saved and restored. Log on a jack-ladder, at Boyle’s Mill, at Davidson, near Fort-Coulonge. It’s in the immediate vicinity of Fort-Coulonge and Mansfield that two of the Outaouais’ best known lumbermen George Bryson Sr. and J. Edgar Boyle, left their mark more than a century apart from one another. George Bryson found fame in the lumber industry from 1843 to 1887, in Fort-Coulonge and Mansfield. J. Edgar Boyle attracted attention in two neighbouring geographical district: from 1928 to 1946 he worked out of the Upper Gatineau and from 1946 to 1968, in the Coulonge River Watershed1. In 1951, he breathed new life into the Davidson sawmill located a few miles North of Fort-Coulonge. It was a complete success2! 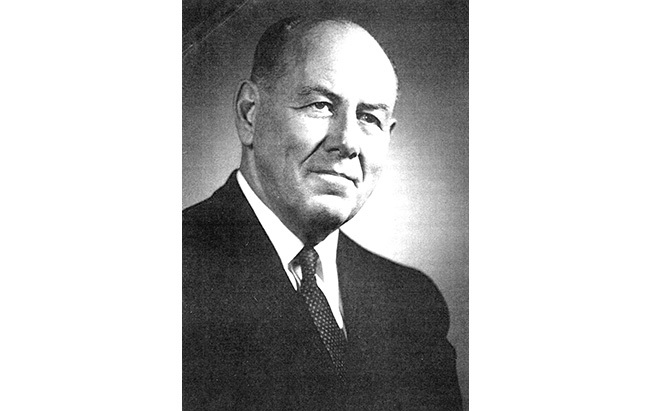 In 1968 he sold his last company, the W.C. Edwards Company, to the E.B. Eddy Company and retired3, just like George Bryson Sr. did in 1887. George Bryson, a native of Scotland, was born in 18134. His parents immigrated to Canada and settled in Ramsay Township, near Lanark in 1821. In 1835 George settled in Fort-Coulonge and jumped on the square-timber trade bandwagon to fill the needs of the British market. A bit later, he steered his sawmill production to fit the demand of the American market. Moreover, it was in 1854 that he arranged for a magnificent residence to be built for himself and his family, today’s Bryson House, which was to be surrounded by sheds and outbuildings. The stone house that is part of this ensemble housed the head office of his company for many years5. George Bryson and his sons John and George played a major role in municipal, provincial and federal politics. George Senior was a Quebec Legislative Councillor from 1867 to 1887. His son George took over from him in 1887. His other son, John Bryson, was mayor of Mansfield and Pontefract from 1882 to 1891 and Conservative Member of Parliament for Pontiac in the House of Commons from 1882 to 18966. George Bryson was a wary and cautious businessman. He owned a farm that supplied provisions to his own shanties, which reduced his operating costs. He liked playing the role of a middleman in most of the lumber trade operations. Even if he had his own sawmill7, he seem to prefer supplying the sawmills located below Fort-Coulonge. Maybe it was his way of reducing the risks linked to the sudden fluctuations in the lumber market. Whatever the reason, his financial situation stayed on a solid footing until his death. His credit and reputation are such that he was able to play a major economic role throughout his career. In 1870, he was closely involved in the creation of the Upper Ottawa Improvement Company and in 1874 he backed James MacLaren in establishing the Bank of Ottawa. In 1880, he took an active part in getting a railroad to run up into the Pontiac: the Pontiac and Pacific Junction Railroad8. The railway mockingly referred to as the Push, Pull and Jerk, will eventually reach Waltham. In George Bryson’s time, Pontiac County produced most of Quebec’s white and red pine squared timber. 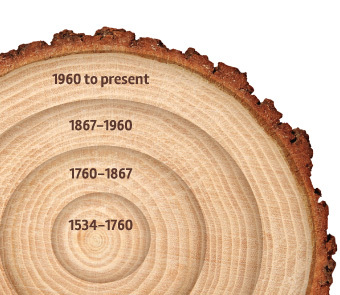 In 1881, it accounted for 61% of the white pine and for 73% of the red pine. 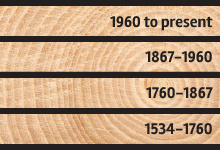 In 1871, the Pontiac’s white pine production was reported to be 5 500 494 cubic feet9. It dropped to 2 958 444 cubic feet in 1881 and to 727 987 cubic feet in 1891. The red pine production was much lower however. It stood at 173 791 cubic feet in 1871, at 480 125 cubic feet in 1881 and at 137 000 cubic feet in 1891. 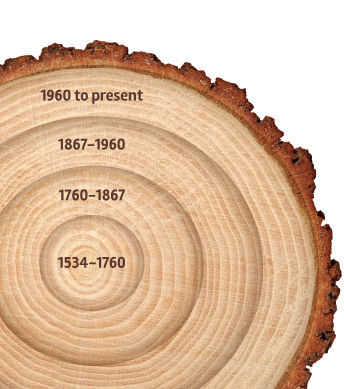 In 1901, the combined white and red pine square timber production had fallen down to 671 489 cubic feet10. J. Edgar Boyle built his fortune in the forest industry by taking advantage of the large lumber firms’ mismanagement. The officials and forest engineers of the large companies didn’t do enough ground work. They planned everything from a theoretical framework and neglected some down to earth facts. They were only interested in certain tree varieties, those they needed to run their factories. The other species of trees that were to be found on their timber limits were of no interest to them11. Boyle knew full well that there was a market for hardwood and for pine, varieties that were not part of the pulp and paper manufacturing process. He therefore bought the right to harvest those wood species on the E.B. Eddy and Canadian International Paper (CIP) limits. J. Edgar Boyle took advantage of this oversight of the large pulp and paper manufacturers to create his own business concern. In the small Schyan River Valley in the space of eight years (1946-1954) he harvested more than 25 000 000 board feet measure of good quality pine12. As for the Black River watershed, for many years it supplied the wood needed to operate his Waltham sawmill, the yearly production of which was 12 000 000 board feet measure13. Built on Lot 4 of Range 1 of Waltham Township in 1948, it had a workforce of about fifty employees14. 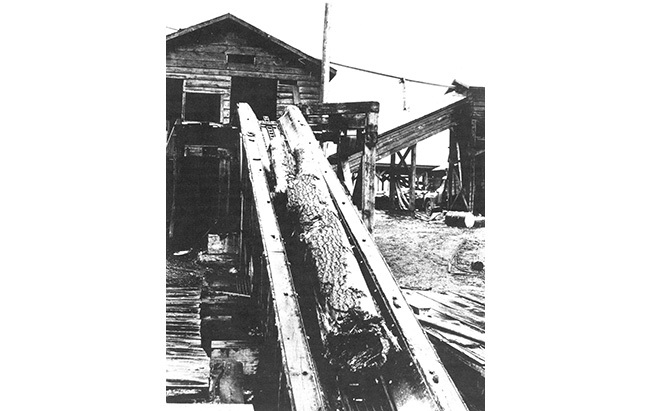 The Davidson sawmill, restarted in 1951, employed about 80 men, six to seven months a year. In 1954, 6 480 000 board feet measure are sawed there: 5 438 400 board feet measure of pine, and 1 042 000 board feet measure of linden or bass-wood15. All of that was due to J. Edgar Boyle’s shrewdness and enterprising spirit. His impressive contribution to the development of the resources of the Pontiac is undeniable. For a brief span in time, Boyle had taken up where George Bryson had left off. 1 J. E. Boyle, ”My Life and Times in the Bush” in Up the Gatineau, no 15 (1989), p. 18-19. 2 Ibid., p. 24. The locality took its name from Davidson and Sons Company Limited, the firm that built a sawmill there in 1910. 3 J. E. Boyle, op. cit., p. 1. 5 Pontiac Heritage Group (Philip Gabriel and al. ), Le patrimoine architectural du Pontiac, Québec, ministère des Affaires culturelles du Québec, Collection « Les cahiers du patrimoine », no 14, p. 56-57. 7 In 1871, he owned a sawmill built on an island located above High Falls on the Coulonge River. About 3 000 sticks of timber are sawed there yearly by a staff of 15: twelve men and three boys. See: Philip Gabriel, «George Bryson», in L’Outaouais : Actes du colloque sur l’identité régionale…, Hull, IHRO, 1981, p. 27. 9 The 1871 Industrial Census reports that 130 000 cubic feet of squared pine timber and 30 000 cubic feet of squared timber of various other forest species were cut on George Bryson’s timber limits in that very year. 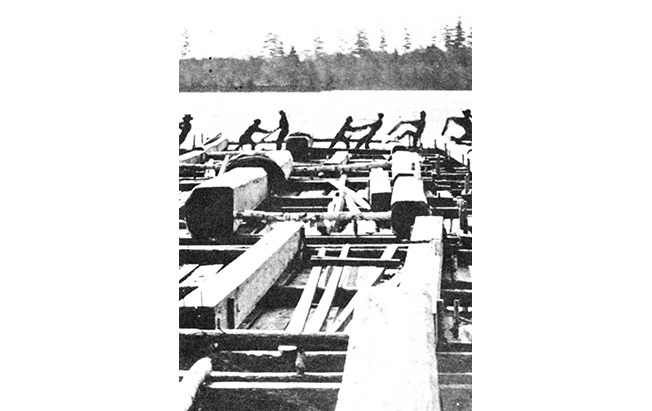 To this should be added another 130 000 pine sawlogs, floated down the Ottawa River to be sold to sawmills located below Fort-Coulonge, probably at the Chaudières Falls . See: Philip Gabriel, « George Bryson », in L’Outaouais : Actes du colloque sur l’identité régionale…, Hull, IHRO, 1981, p. 27. 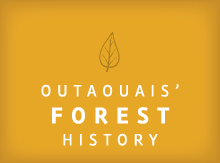 10 « Produits des forêts » in Recensements publiés du Canada, 1871, 1881, 1891 et 1901. 11 J. E. Boyle, op. cit., p. 9 et 18. 14 Quebec, Industry and Commerce Department, Inventaire des ressources naturelles du Pontiac, , Section dealing with the Municipality of the United Townships of Waltham and Bryson. 15 Ibid., Section dealing with the Municipality of the United Townships of Mansfield and Pontefract. The Davidson sawmill is located on Lot 43 of Lot 15 of Range 1 in the Township of Pontefract. Source: Pontiac Heritage Group (Philip Gabriel and al. ), Le patrimoine architectural du Pontiac, Québec, ministère des Affaires culturelles du Québec, 1981, Collection « Les cahiers du patrimoine », no 14, p. 52. 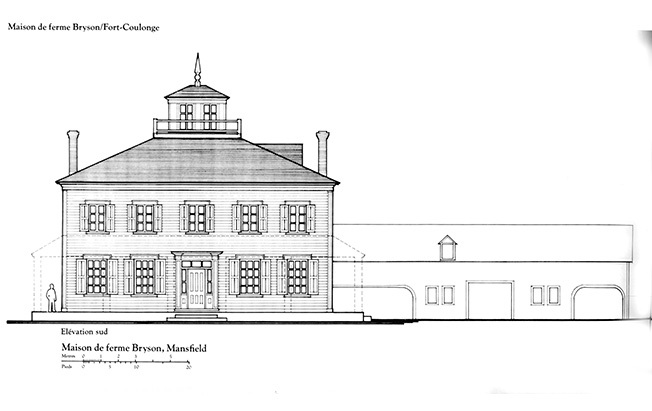 Caption: Plan and elevation of the Bryson House as drawn by Philip Gabriel. Source: Pontiac Heritage Group (Philip Gabriel and al. ), Le patrimoine architectural du Pontiac, Québec, ministère des Affaires culturelles du Québec, 1981, Collection « Les cahiers du patrimoine », no 14, p. 54. Caption: Elevation of the Bryson House as drawn by Philip Gabriel. Source: Pontiac Heritage Group (Philip Gabriel and al. ), Le patrimoine architectural du Pontiac, Québec, ministère des Affaires culturelles du Québec, 1981, Collection « Les cahiers du patrimoine », no 14, p. 55. Caption: Elevation of the Dagenais House. It used to be the head office of the Bryson Lumber Company. Drawing by Philip Gabriel. Source: Bank of Canada. National Currency Collection, item 1965, 0136, 06748, 000, a1, 2d0124. Caption: First $4 bank note issued by the Bank of Ottawa, in 1874. On the left can be seen the photograph of George Bryson and to the right, that of James MacLaren. Source: Library and Archives Canada, C-23028. Photographer unknown. Caption: Group of raftsmen pulling like mad at the oars to guide their square timber raft. George Bryson Sr was particularly involved in this sector of the timber trade. Source: Pontiac Heritage Group (Philip Gabriel and al. ), Le patrimoine architectural du Pontiac, Québec, ministère des Affaires culturelles du Québec, 1981, Collection « Les cahiers du patrimoine », no 14, p. 56. 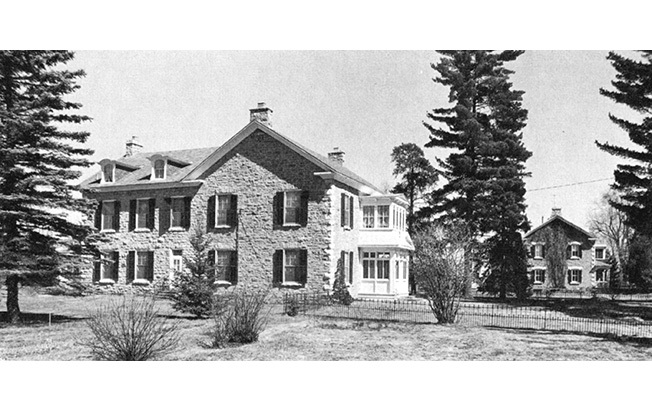 Caption: The large stone mansions of George Bryson Jr and of his brother John Bryson. 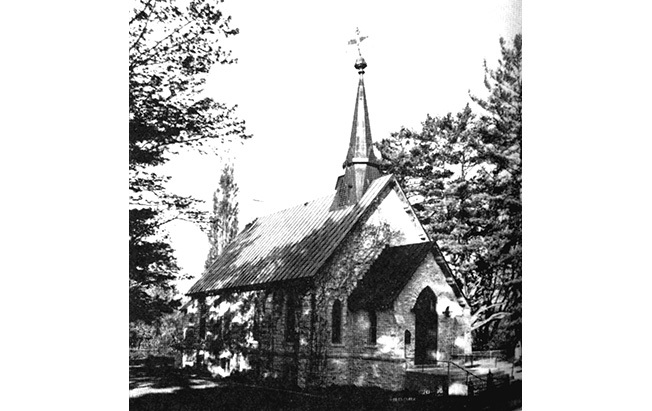 Caption: Fort-Coulonge’s St. Andrew’s Presbyterian Church, built in 1890. This jewel of religious architecture is due to the financial generosity of the Brysons, a staunch Presbyterian family. Source: Pierre Louis Lapointe Collection. Photographer: Pierre Louis Lapointe, 1975. Caption: This photograph shows the state of neglect in which the Bryson House group of heritage buildings were in around 1975. The role played by Philip Gabriel and his friends from the Pontiac Heritage Group saved this architectural ensemble for posterity. 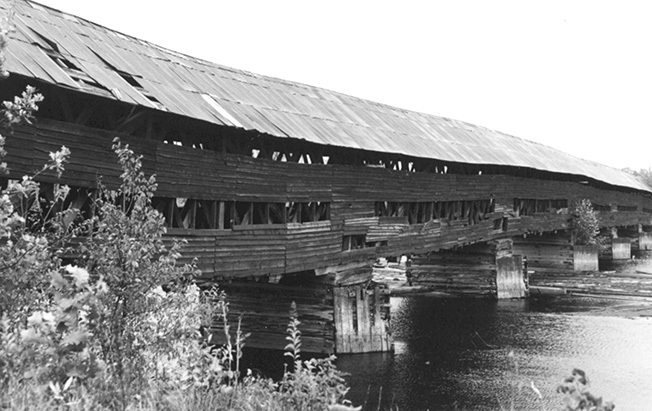 Caption: State of disrepair the Marchand covered bridge linking Mansfield to Fort-Coulonge was in around 1960. The local population was mobilized and the bridge was saved and restored. Source: J. E. Boyle, “My Life and Times in the Bush” in Up the Gatineau, no 15 (1989), p. iii. Photographer unknown. Source: John W. Hughson and Courtney C. J. Bond, Hurling Down the Pine, Chelsea, The Historical Society of the Gatineau, 1987, p. 74. Photographer unknown. Caption: Log on a jack-ladder, at Boyle’s Mill, at Davidson, near Fort-Coulonge.